Hard Carrying Case and Calibration Standards Included! With FTU range 0.00 to 50.00 and 50 to 1000 FTU. Resolution 0.01 (0.00 to 50.00 FTU) and 1 (50 to 1000 FTU). 3 points calibration (0, 10 and 500 FTU). 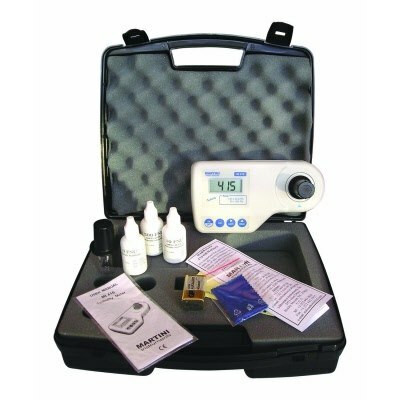 Supplied in a hard carrying case with calibration solutions, cuvette, wiping tissue, and instruction manual. The Milwaukee Turbidity meter measuresis achieved by analyzing the quantity of light refracted from suspended particles such as clay, silt and other organic material. For potable drinking water applications turbidity is a great indication of water quality. Turbidity Measurement is achieved by measuring the amount of light refracted from suspended particles such as clay, silt and organic material.